In the latest article about in-game screenshots for the anniversary, BioWare explains in the details listed below on how to be involved. 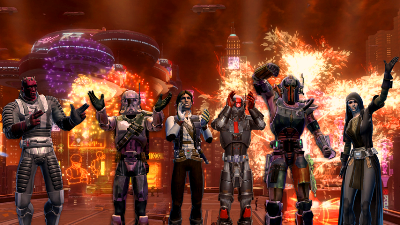 Email your screenshots to celebrate_EN@swtor.com before January 2nd, 11:59PM CST. Total email size cannot exceed 5MB. As many of you are already aware Patch 1.6 is now live in-game. 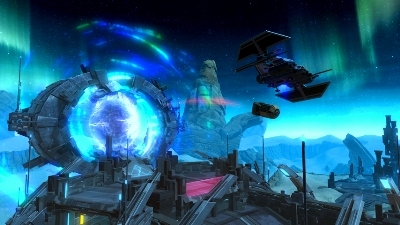 The two major content features are the new warzone, The Ancient Hypergates and the new Heroic Space missions. Unfortunately, I have yet to get any opportunity to play the game and experience the new content. What are some of your feelings on the new content? How is the new warzone and the new heroic space missions? Please let us know your Patch 1.6 feedback in the comment section below. Now enjoy the new trailer for update Patch 1.6! Additionally, the Gargantuan Lobel may not spawn as intended. We apologize for the loss in credits and crafting mats, and we’re working on implementing changes to fix this. In the meantime, the Operation can currently be completed per usual with the aforementioned spawn issues. We have updated the Known Issues thread to reflect these issues, as well as new spawn issues with Maelstorm Prison and Explosive Conflict. Here is an update on the spawn issue with the Terror From Beyond Operation. This has been added to the known issues thread, but hopefully they will have this fixed soon, possibly today, or by this weekend. If you or anyone in your group notices any other issues not found in the known issues thread, be sure to issue a ticket and also make a post in the forums. This is not something any subscriber wants to have happen to their account. If you happen to have one of the accounts affected by this situation, be sure to follow the above steps so customer service and support staff can help find a solution to fix the problem. This week Corellian Run Radio has an exclusive interview with Rob Hinkle from BioWare about PVP. Be sure to take a look at this article and leave your feedback on this interview. Also don’t forget to take some time to catch up on your favorite CRR weekly articles. As you read our writers’ articles, be sure to take a moment and submit your feedback and suggestions in the comment sections. We love to hear from you. Thanks and enjoy the links below. Now through December 17th, Etsy will guarantee Christmas delivery on this Star Wars coffee mug set. The glass coffee mug set has the famous lines between Han and Leia from Episode V: The Empire Strikes Back, as Han was being lowered into the carbonite freezing chamber. This gift would be perfect for a young couple for their first Christmas, or a gift for that special someone in your life to let them know how you feel. Next on our Star Wars gift idea list is this R2-D2 USB hub. Not only is the a replica of almost everyone’s favorite astromech, but it is also a 4-port usb hub. This 4-port hub is great to plug-in that gaming mouse or your usb headset or whatever possible usb device you need close by to use or charge. The usb hub also makes sounds like R2-D2. So if you have a computer geek or Star Wars fanatic on your list this might just fit the bill. Now for that Star Wars fan who has everything, I have the following suggestion, especially if they are a huge Chewbacca fan. Marc Ecko has an entire line of Star Wars jackets and hoodies. 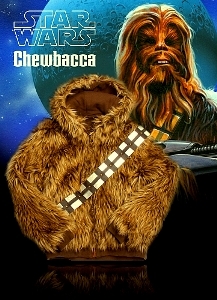 One of these hoodies pays tributes to the “big walking carpet” Chewbacca. It is a furry hoodie, that is fur look on the outside and a cloth stitched ammo belt. Now this hoodie can also reverse and have the fur on the inside with a chocolate brown color outer shell it also has the leather rebel symbol. I will be honest this is not most practical gift, but if that Star Wars fan on your list is worth the extra…I’m pretty positive they will be blown away to open this gift. What are your thoughts on new Life Day items? I’m curious to hear what you are readers think about the new items with the Life Day theme that BioWare has added to the Cartel. Do you like the items? Would you like to see more items and even events surrounding holidays etc. added in-game? If so what are some ideas you would like to see added for events and such? Please leave your ideas and thoughts in the comment section below. I don’t know about anyone else, but I thought BioWare would actually give everyone a gift for what they are calling “Life Day.” I was completely disappointed that those items were only available through the cartel market. We need more holiday stuff THAT IS FREE (as in give us quests! ).